Spaghetti is one of the dishes we adopted from foreign cultures and our version of spaghetti is somehow different from the original Italian style spaghetti which only consists of tomato sauce plus herbs and spices. 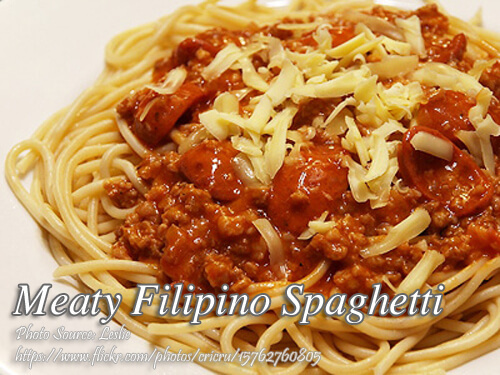 What makes our spaghetti really Pinoy is the addition of banana ketchup, ground meat and hotdog. So why use Italian style spaghetti sauce in this recipe instead of the sweet style or just tomato sauce and tomato paste? With the varieties we tried when we are cooking spaghetti, I think our taste buds like the Italian spaghetti sauce but you can also substitute it with tomato sauce and about 1/4 cup tomato paste. Spaghetti is one of the dishes we adopted from foreign cultures and our version of spaghetti is somehow different from the original Italian style spaghetti. In a large pot with water, bring it to a boil then add salt and cooking oil. Salt adds flavor to the pasta and the cooking oil prevents the pasta from sticking together. Then add the spaghetti pasta and cook according to the instruction on the package. Check if the pasta is already cooked and tender, firm but not hard (al dente). Don't overcook the pasta so it will not become too soggy. Drain the water in the sink and fill the pot with tap water to prevent the pasta from overcooking. Drain the water again and pour the pasta in a colander or strainer to remove the excess water. Let it drain for a few minutes then transfer to a Tupperware or any container that can hold the pasta. Set aside. In a medium size saucepan, melt the butter and saute the garlic and onion until the onions are cooked and transparent. Then add the ground beef and stir cook for at least 5 minutes. Then add the hotdog and cook for 2 minutes again. Add in the spaghetti sauce, bouillon cubes, banana ketchup and 1 cup of water then simmer again for 20 minutes. Stir the sauce while cooking from time to time to prevent the bottom of the sauce from burning. Prepare a serving dish or platter and put the pasta then pour the sauce on top of it. Garnish with grated cheese on top and serve. 1 kilo of spaghetti can have up to 8 servings to people with big appetite and up to 10 people who eat normally. You can reduce all the ingredients to half if you want to serve only 4 people. Hi, can I use meatballs instead of ground meat? Thanks! When simmering, the fire must be low or high? Hi Gelo, the fire must be low when simmering. 2 boullion beef cubes? Where to buy po? Hi Michelle, actually bouillon beef cubes is Knorr beef cubes and Maggi beef cubes.